The Missouri House is currently debating proposed changes in Jefferson City in Missouri’s $28 billion state operating budget. The Missouri Conference Committee on Budget made numerous recommendations earlier this week. The House voted Wednesday morning to approve record funding of $98 million for the K-12 education foundation formula. State Rep. Justin Alferman, R-Hermann, emphasized several times Wednesday morning that this is record funding. “If you don’t believe in students, vote no,” Alferman says on the House floor. But Democrats say more funding is needed. State Rep. Brandon Ellington, D-Kansas City, questions the figures provided by Republicans. The debate over Higher Education also got heated at times on Wednesday. State Rep. DaRon McGee, D-Kansas City, tells House colleagues that Harris-Stowe State University in St. Louis needs help. State Reps. Alferman and Bruce Franks Jr., D-St. Louis, agree that Harris-Stowe serves numerous underprivileged students. The budget bill approved 119-28 Wednesday contains $750,000 in one-time funding for Harris-Stowe, which is less than the $2 million requested by State Sen. Jamilah Nasheed, D-St. Louis. The House has approved another bill providing $750,000 in capitol improvements for Harris-Stowe. The Senate still needs to approve that. 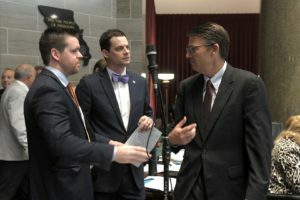 The House Wednesday also approved a budget bill that contains a pay raise for Missouri’s state employees. Under the plan, state employees earning less than $70,000 would receive a $700 pay raise in January. Those making more than $70,000 would receive one percent. Debate continues on the House floor on other budget bills, as this article is being written. The Missouri Constitution requires the Legislature to approve a balanced budget by Friday evening.